Don’t just pray about what seems logical and possible. 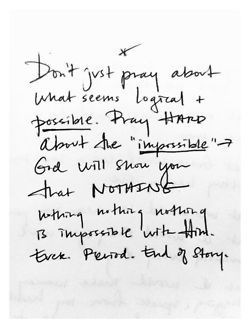 Pray hard about the impossible. God will show you that NOTHING, nothing, nothing, nothing is impossible with Him. Ever. Period. End of Story. I am fascinated lately by this imagery, Glorious Ruins, life from the ashes, beauty springing forth from destruction. I guess this is what hope is, if you had to put a label on this picture. But in my mind, this is bigger than that. Hope is defined as “a wish to get or do something, or for something to happen or be true, especially something that seems possible or likely.” What I am talking about is a hope that is bigger than a wish. A belief in the impossible! Hope that is only possible through the hand of God, our Father. Who else can take a story of death and disease and turn it beautiful. Not me, not without God. Who else can repair relationships that are damaged beyond our ability to communicate? Only through God. He is the one who can get to the “heart” of the matter. We can’t change others, we can’t fix them, our love isn’t enough. But God’s is. He is the perfecter of love and He wields the power to change the unchangeable. Nothing is to big for God! Sometimes we have to see things torn apart around us, we ourselves have to be torn down, before we can spring forth, emerging stronger and more beautiful. God’s hand in this process repairs us, so that even if our situation doesn’t change, we will still shine brilliantly, reflecting His love. A lighthouse in the middle of the storm, guiding others to Him through that light of love. But being broken hurts, and healing, is a slow and painful process. “Blessed is he whose help is the God of Jacob, whose hope is in the LORD his God, the Maker of heaven and earth, the sea, and everything in them– the LORD, who remains faithful forever” (Psalm 146:5,6). Where is your hope springing forth from today? Maybe a better question, the first question, is do you have hope? Are you listening to a world that tells you to make wishes on stars and put your faith in the things that seem likely? Or in a God who says “Dream the impossible. I love to answer big prayers in big ways.” Those big miraculous answers are the answers that are unmistakably from the hand of God. In answering our big prayers, in bringing forth life from the ruins, His glory shines brighter. Today, put your hope in God, not the things of this world. Allow Him to have control, not only of your situation, but also your heart, and then have the faith that He will not disappoint you! Father God, You know my every desire and wish. You know the secrets of my heart. You know that sometimes I am afraid to hope for the impossible because of my fear of disappointment or failure. Please help me to continue to put my hope in you and my fuel my faith in Your miraculous power. Help me to remember, no matter how big or small Your answer to my prayer, it is exactly right in Your plan for my life. When things seem to be falling apart around me, help me to remember that this hasn’t slipped by without your knowledge. You are the giver of life, and I will cling to Your promise of restoration and wholeness, even in the midst of the ruins, knowing that if it is Your sovereign plan, goodness and growth will spring forth from it. I know your Word says you have big plans for me, good plans for me. That you are able to do immeasurably more than I ask or even imagine. Please Lord, plant in me the seeds of longing for Your plans. Help the dreams I dream, be rooted and aligned in Your will, and help me not to sell them short for fear of the impossible. I pray all of this in your holy, powerful, life-giving name. Amen.